Our specialised neuro-physiotherapists in London are highly trained and have experience working with patients with neurological conditions such as Multiple Sclerosis (MS). Our neuro-physiotherapists have been working in neuro physiotherapy rehabilitation centres and private practices for many years, using the latest rehabilitation techniques available. During the early stages of the disease, our physiotherapist will evaluate your abilities and create an exercise programme for you, in order to sustain your independence, reduce the impact of the disease and improve your overall quality of life. At the later stages our physiotherapist can help manage specific symptoms, such as pain, spasticity and tremor. We offer domiciliary treatment anywhere in London, so you don’t have to worry about transfer if you are already experiencing mobility issues. You can just save your energy for the physiotherapy session. However, we also offer treatment at two Light Centre practices in London, Light Centre Moorgate between Liverpool Street and Monument station EC2 and Light Centre Belgravia in Westminster near Victoria station SW1, as well as at our physiotherapy practice in Clapham between Clapham South and Clapham Common stations SW4. We offer appointments on short notice. Physical therapy can play an important role in keeping a patient with multiple sclerosis active, functional and independent for as long as possible. The earlier the physiotherapist is involved in the management of the condition, the bigger the benefits from the treatment. During the early stages, it is very useful to have an assessment with a specialised neuro-physiotherapist, in order to establish a baseline of your current abilities and compare them in the future, as the condition progresses. The physiotherapist will then create an exercise programme according to your needs, which will help strengthen your muscles and hence improve your balance and coordination. As the disease progresses, the physiotherapist can help you with maintaining your walking abilities (gait rehabilitation), and use stretches to help you with mobility and prevent muscle spasms and pain. If needed, they can help you learn how to use a walking aid. Keeping active as long as possible is key to fighting multiple sclerosis. Our physiotherapist is also a personal trainer and can help you set up an exercise program. Pilates is a soft but efficient way of exercising and toning without strong impact on your body, which is a good form of exercise for patients with multiple sclerosis. 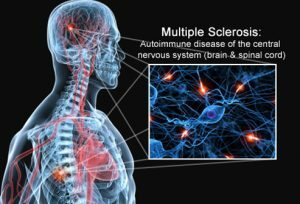 What Is Multiple Sclerosis or MS? What Are The Symptoms Of Multiple Sclerosis? Multiple sclerosis, also commonly called MS, is a chronic, inflammatory, degenerative neurological disease that damages the nerves. It affects mostly young adults between the ages of 20 and 50 and it affects women more than men. The symptoms usually appear progressively, although in some cases, the condition can be aggressive and advance quickly. Many people with multiple sclerosis may have these symptoms for a few weeks, and then have long periods of time without any symptoms. As the disease progresses, the periods when they have the symptoms are longer and the symptoms become more intense.